This quick color study I did in the margin of the of the painting to get a feel for some of the possible color mixtures available with this palette. 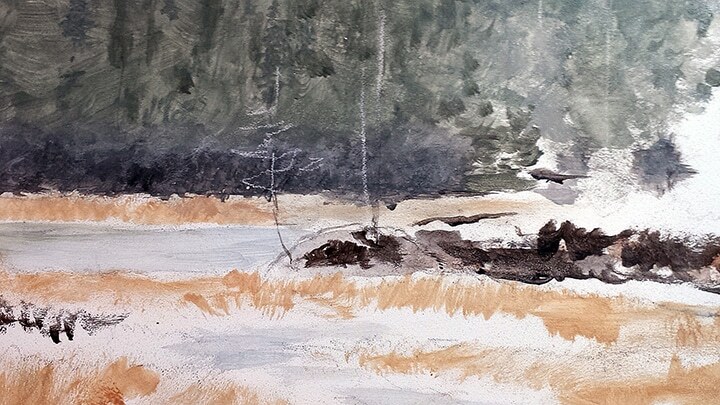 I don’t do this very often but this piece contains a lot of grays and it was useful in choosing the appropriate ones. The chart shows the palette I used and some combinations of their mixtures, the ones below them have white added to them. I began with the sky and worked down into the distant trees. Note the section above and below the image that is not being used. This is because I will often buy a standard size board and crop to the proportions I need. The leftover will be trimmed off with a band saw before I frame it. 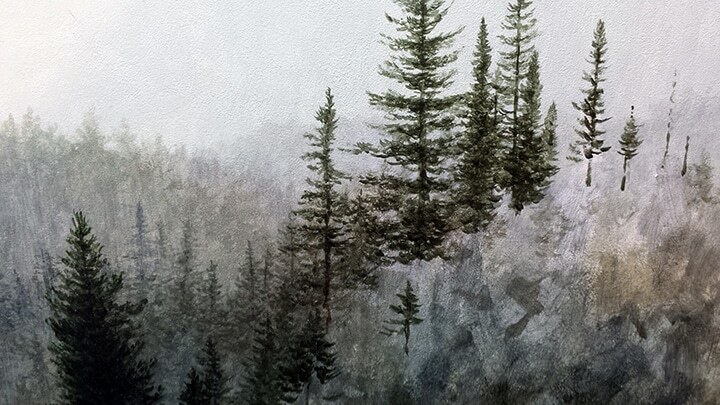 I continue to work forward creating a treelike texture using a stiff round brush with a good amount of matt medium mixed with the acrylic paint. 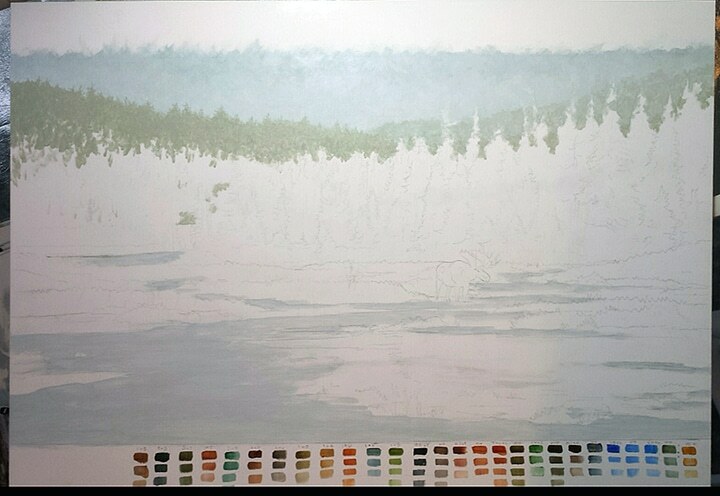 I also begin to block in some color into the other areas of the painting. 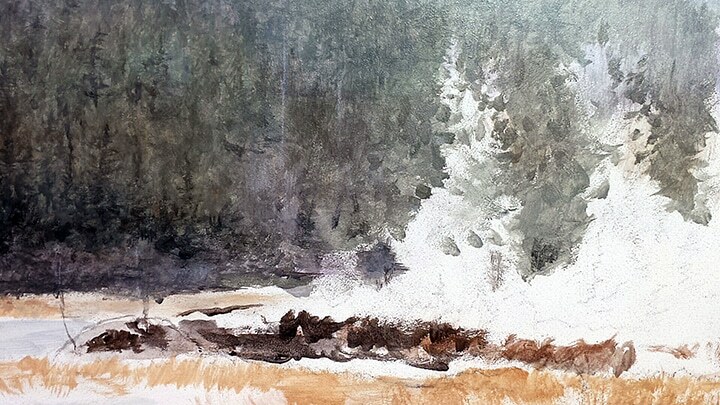 In this closeup you can see the texture of the brushwork. 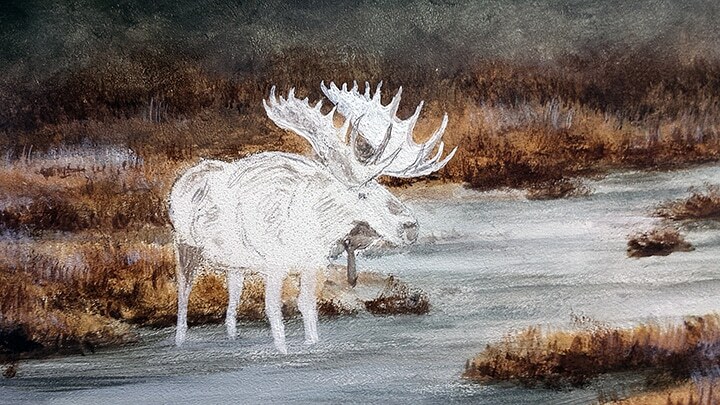 I am using gessobord, a prepared hardboard that is preprimed and has a slight texture that I find good for this type of subject. I sometimes want a smoother surface in which case I will use a masonite board and apply gesso that has been diluted with water. I will usually give the surface seven coats allowing each one to dry and sanding with a fine grit sandpaper. My initial pencil drawing is not too detailed, mainly because I know that much of it will be covered by paint. So I will often draw with my paint brush as I work or sometimes I use a black charcoal pencil or if I need to draw on a dark area, I use a white charcoal pencil as seen here. 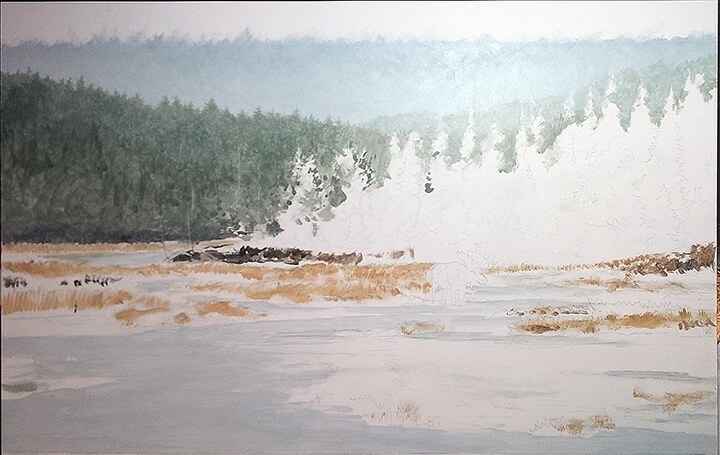 I am beginning the group of trees that is closest, this will take some time as I draw the tree shape against the background with a #3 round sable brush. As I work, I will continue to fill in more of the body of the painting, this helps me get a feeling of balance in the piece. 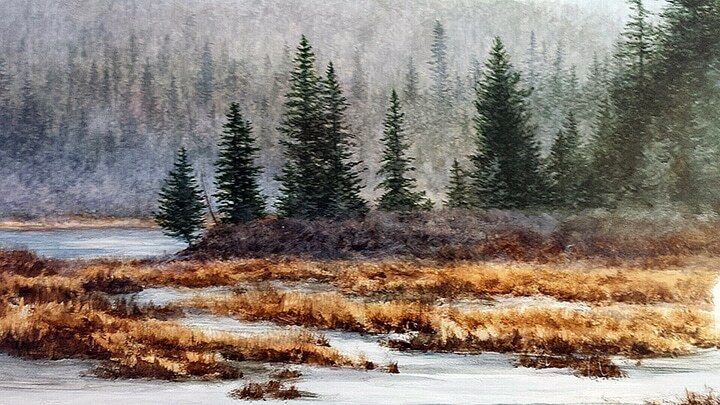 I use a # 4 filbert brush to fill in the grassy areas along the water. 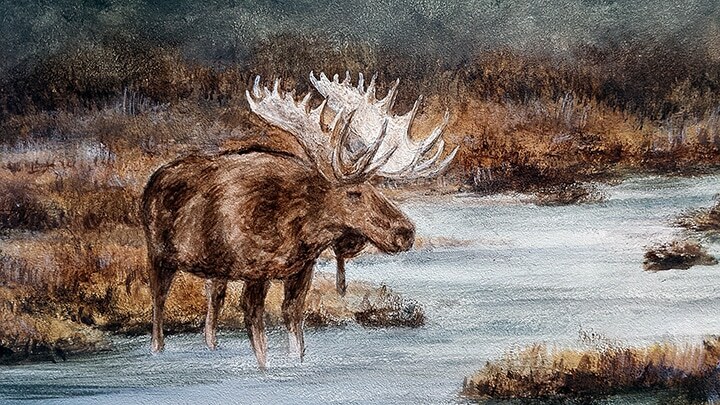 At this point most of the painting is close to where it will end up, I have saved the moose for near last so I can adjust the value (lightness or darkness) to contrast against the background. 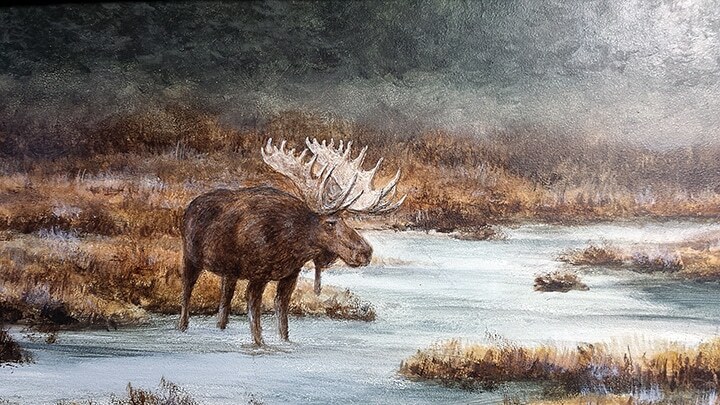 Another way to do this would have been to paint the moose first but I felt that would not work as well. 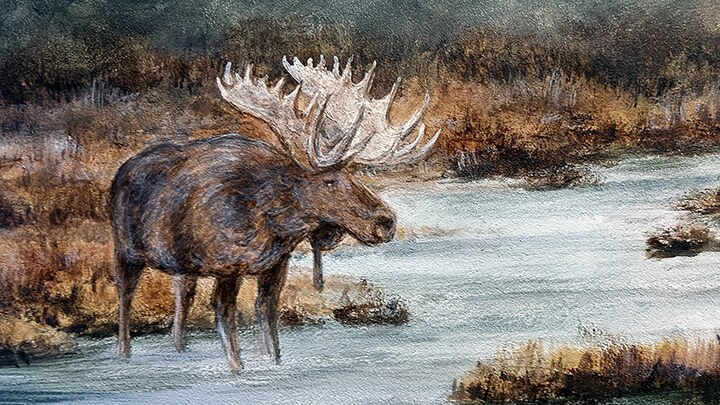 These next 4 images show the painting of the moose. 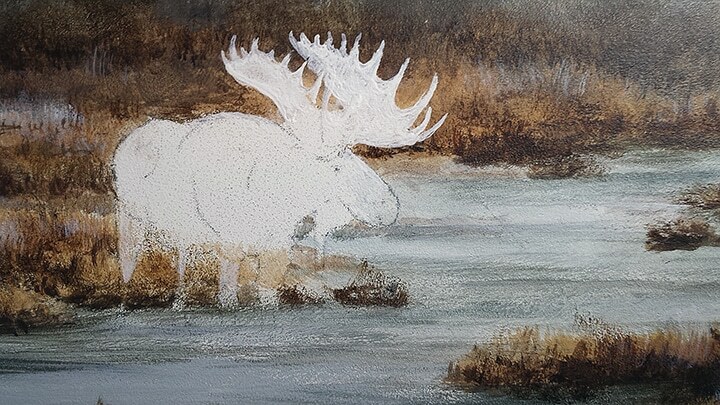 Note I painted the moose shape white to maintain a uniform color as to not look transparent. 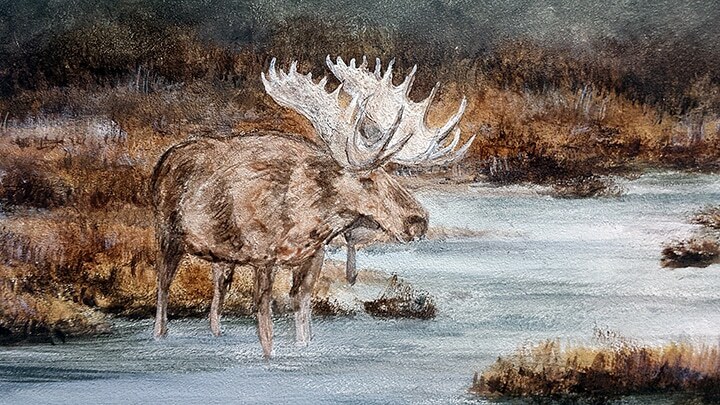 Most of the moose is painted, I will make slight alterations to the background to blend him into the space. 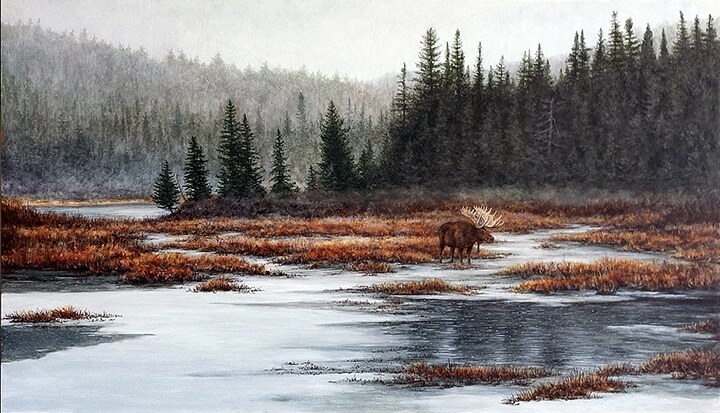 The atmosphere plays an important role in this painting. 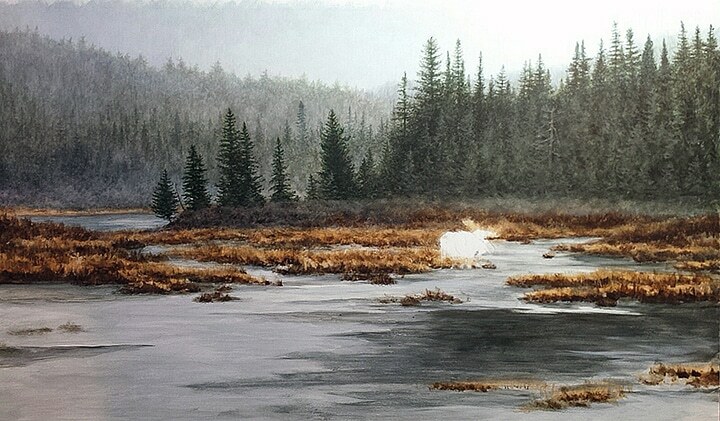 I was driving through the Adirondacks in early November, It had been cold and snowed the night before and the small ponds were beginning to skim over. As the day progressed the temperature rose just enough for the snow to turn to rain. A fog was rising from some of the deeper parts of the water and hung close to the bottom of the trees. 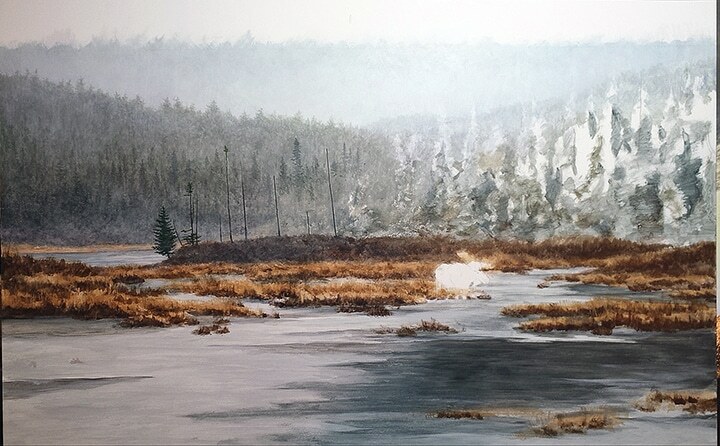 To imitate this effect I used a technique where I add a large amount of matt medium and water to white acrylic and carefully build up thin layers using a soft brush and blotting off any excess until I have the desired look I am after. Note the rain splashes on the water in places. Before I decide if a painting is done, I will place it somewhere and study if for a few days. Most of the time I may change something minor. If it’s not minor I have a big problem and should should have seen long before now. 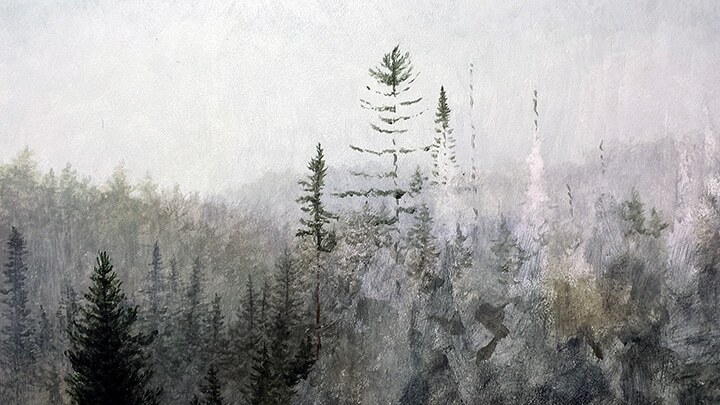 In this case I felt the dark set of trees had little depth so using the technique discussed above, I lightened some of the tree tops to give them the appearance that they were in the distance. 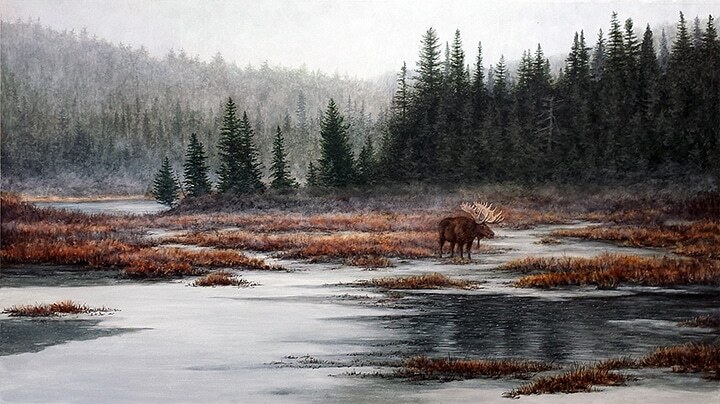 As I stated the background is the Adirondacks but the image of the moose was one I shot in Colorado while visiting the town of Walden, one September.